30.5.1919: Launched by Hawthorns & Co Ltd, Leith (Yd.No174) (“Strath” class) for The Admiralty as JOHN CONNE (Ad.No.4476). 1.3.1920: Registered by The Admiralty as a fishing vessel at London (LO341). 4.3.1920: Completed as a fishing vessel. 11.1921: Sold to Don Fishing Co Ltd, Aberdeen (J. S. Doeg, manager). 8.11.1921: Registered at Aberdeen (A770). 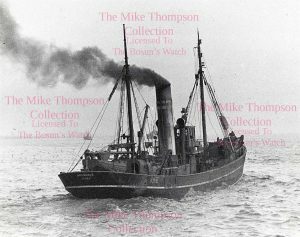 11.1921: Registered at Aberdeen as BRACONBUSH (A770). 4.1941: Sold to Boston Deep Sea Fishing & Ice Co Ltd, Fleetwood (Basil A. Parkes, Cleveleys, manager). 29.1.1942: Out of Aberdeen for Minch grounds. Mined off Duncansby Head. Taken in tow for Scrabster but foundered; crew of eleven saved. 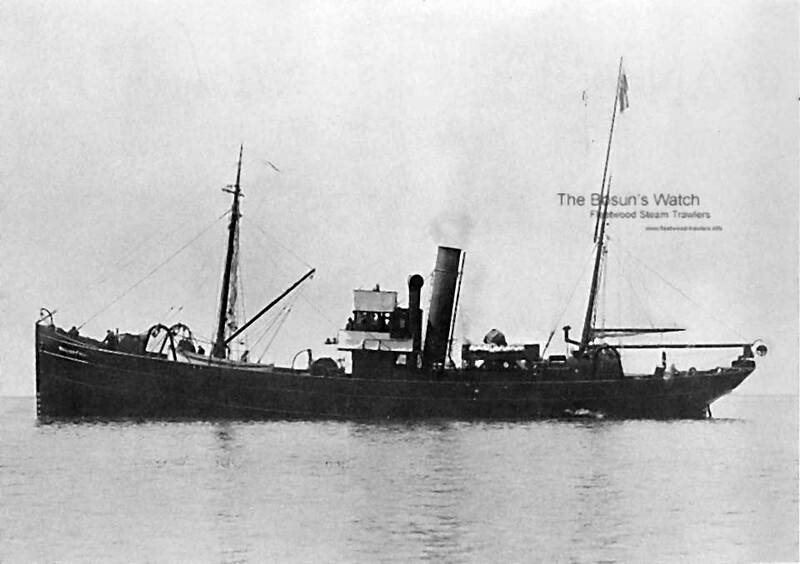 This entry was posted in Lost Vessels, Steam Trawlers, War Losses and tagged Boston DSF & I, Lost, Parkes, Strath Class, War Loss on May 14, 2012 by Fred Smith. 29.5.1918: Completed as a minesweeper (1-12pdr, 2-303 cal Lewis MG, Hydrophone & W/T). Built under Lloyd’s Survey. 20.12.1919: Registered by The Admiralty at London (Part I & IV) as WILLIAM FALL O.N.143805 (LO193). 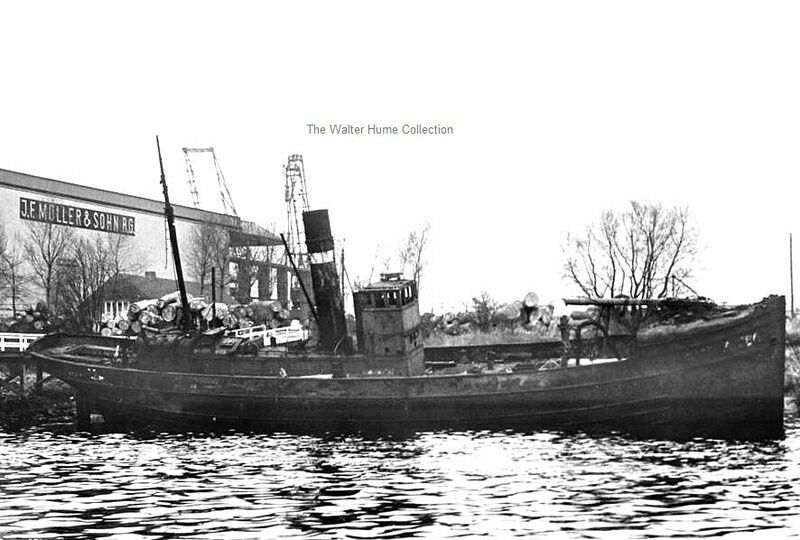 31.1.1920: Sold to The East Hull Steam Trawling Co Ltd (64/64), Hull. 31.1.1920: Benjamin Knowles designated manager. 12.2.1920: Registered at Hull (H166). 5.3.1920: Vessel mortgaged (64/64) to The National Provincial and Union Bank of England Ltd, London (A). 25.3.1920: Registered at Hull as AVONDALE (H166) (BoT Minute 1825-20). 19.9.1923: On an Icelandic trip, Claude Lonsdale (18), Hull lost overboard and drowned. 9.9.1928: 2nd Eng Arthur Skow (47), Hull died in Klaksvig Hospital, Iceland having been taken ill while fishing the Icelandic grounds. 28.10.1932: George Henry Brown designated manager. 21.2.1933: On an Icelandic trip, Richard Pinder (18) lost overboard and drowned in the North Sea. 23.11.1934: Sold to John William Tomlinson (32/64) and John William Tomlinson Jnr (32/64), North Shields. 3.12.1934: John William Tomlinson Jnr designated managing owner. 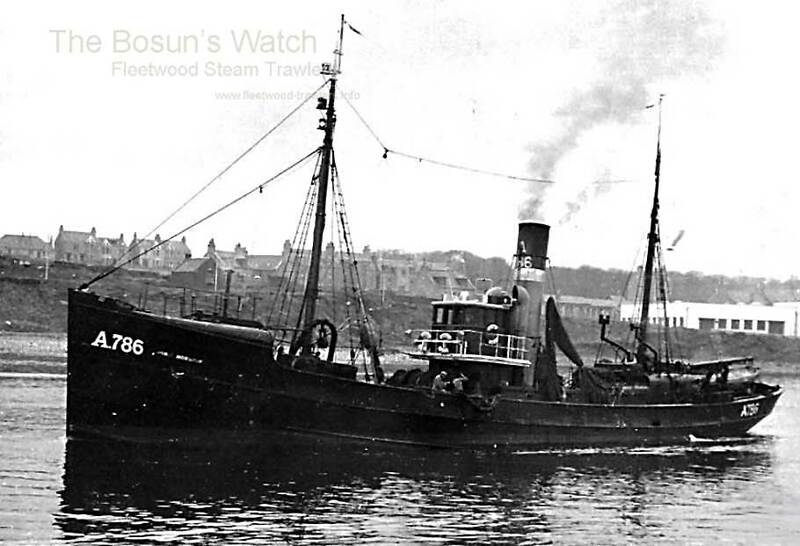 6.9.1940-1945: Fishing out of Fleetwood, landing from Home Waters. 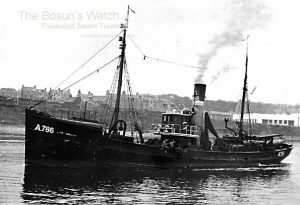 1945: Transferred to fish out of North Shields. 1954: Sold to BISCO for breaking up. 1.12.1954: Hull registry closed “Ship broken up” advice from managing owner and shipbreaker. 01/04/2017: Added another image and removed FMHT watermark. This entry was posted in Steam Trawlers, Steamers (Picture), Wartime Visitors and tagged No Fleetwood owners, Strath Class on September 1, 2010 by Fred Smith. 9.10.1918: Launched by Hall, Russell & Co Ltd, Aberdeen (Yd.No.644) (“Strath” Class) for The Admiralty as THOMAS BARCLAY (Ad.No.4417). 8.1920: Slipped at Wivenhoe. Special Survey. Classed as a Steam Trawler. 24.8.1920: Registered at London (LO444). Laid up. 11.1921: Sold to Harry Alexander Holmes, Aberdeen. 22.11.1921: Registered at Aberdeen (A786). 30.12.1921: Registered at Aberdeen as JOHN MORRICE (A786). 30.1.1929: Sold to George D. Taylor, Alexander Malcolm Morrice, Margaret Morrice, John Morrice & Mary Morrice, Aberdeen (Alexander M. Morrice, managing owner). 28.5.1937: Landed at Fleetwood 240 boxes ‘rock lined’, grossed £345. 27.6.1938: Sold to George D. Taylor, Alexander Malcolm Morrice, John Morrice, Mary Jane Hardie Morrice, James Johnstone & William Davidson, Aberdeen (H. A. Holmes, manager). 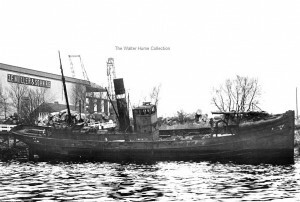 28.3.1940: Sold to North Star Steam Fishing Co Ltd, Aberdeen (John A. Harrow, manager). 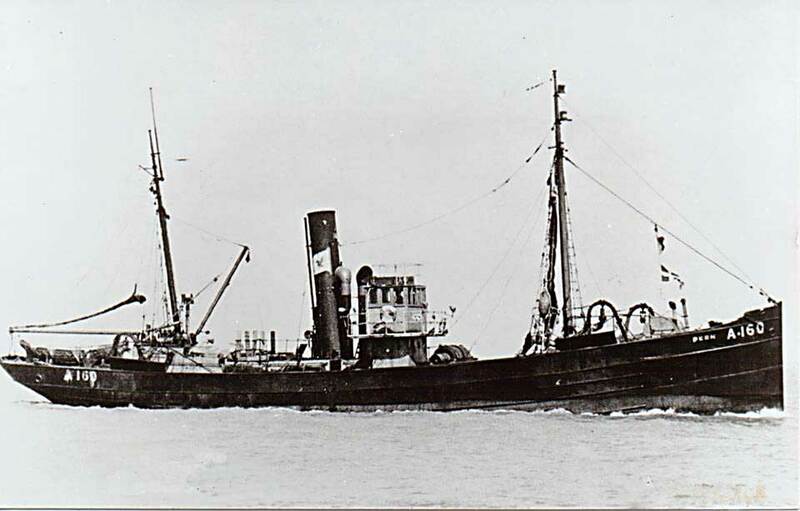 9.3.1940: Fishing 12 miles NW of Tory Island, Co. Donegal in company with ALVIS (H52); FLYING ADMIRAL (H66); PELAGOS (GN55) and SEDOCK (GY123) and reported with the Irish trawler LEUKOS (D86) also in the vicinity. Group approached by U-boat (U.38) which fired a single round at a trawler, hitting her in the engineroom and sinking her. Although no conclusive evidence confirms, the trawler probably was the LEUKOS; all eleven crew lost*. 9.2.1946: Sold to The River Ness Fishing Co Ltd, Aberdeen (George Craig, manager). 7.9.1955: Company re-styled River Ness Fishing Co (1955) Ltd.
23.2..1959: Sold to John Lewis & Sons Ltd, Aberdeen for breaking up at Montrose. 9.1959: Sold to Atlantic Rhederei F. & W. Joch, Hamburg. 4.10.1959: Delivered Hamburg for breaking up. S.T John Morrice A786 at the breakers. 12/08/2010: Page published. 8 updates since then. 11/09/2018: Removed FMHT watermarks from images. This entry was posted in Steam Trawlers, Steamers (Picture), Wartime Visitors and tagged No Fleetwood owners, Strath Class, Wartime Visitor on August 12, 2010 by Fred Smith. 24.3.1899: Launched by Mackie & Thomson, Govan (Yd.No.256) for William Widdowson, Hull (managing owner) as NEPTUNE. 28.4.1899: Registered at Hull (H452). 1902: New boiler fitted (made 1898). 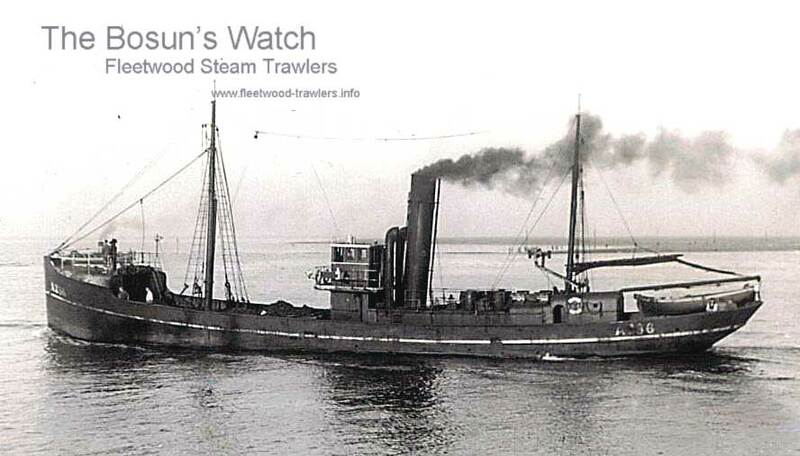 4.1907: Sold to The Lancashire Steam Fishing Co Ltd (64/64), Fleetwood. 1.5.1907: Mortgaged to William Deacon’s Bank Ltd, London (A). 19.9.1907: Registered at Fleetwood (FD124). 19.9.1907: James A. Robertson appointed manager. 26.2.1912: Eight shares sold to John Worthington Golding, Fleetwood. 26.2.1912: Eight shares J. W. Golding) mortgaged for £320 @5% to The Lancashire Steam Fishing Co Ltd, Fleetwood (B). 23.8.1913: Eight shares (J.W. 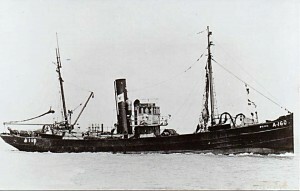 Golding) sold to The Lancashire Steam Fishing Co Ltd, Fleetwood (James A. Robertson, manager). 1.1.1914: Tonnage altered to 67.20net under provision of Merchant Shipping Act 1907. 5.1914: Sold to Haugesunds Sparebank, Haugesund. Pre 1927: Sold to S. Sandved, Haugesund. Pre 1930: Sold to M. Salomonsen, Kopervik. 1936: Sold to A/S Havöy, Haugesund, Norway (J. Kyvik & S. Fresvig, managers). Renamed HAVÖY. 1944: Sold to J. Taranger, Bergen. Renamed TORHAV. 1956: Sold for breaking up. 18/05/2017: Removed FMHT watermark from image. 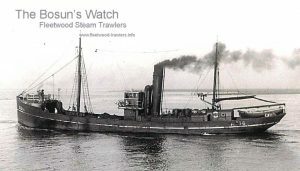 This entry was posted in Steam Trawlers, Steamers (Picture) and tagged John Worthington Golding, Lancashire SFC, Strath Class on January 18, 2009 by Fred Smith.